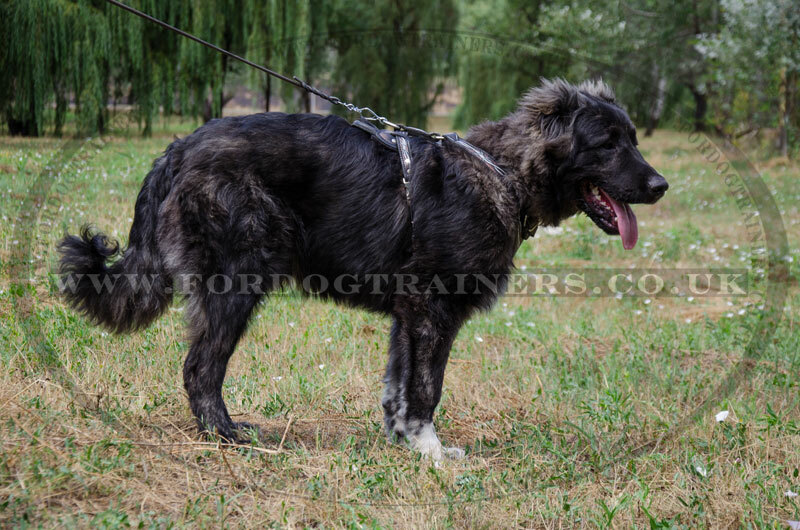 Leather dog training harness is a great choice for Caucasian Shepherd guarding. 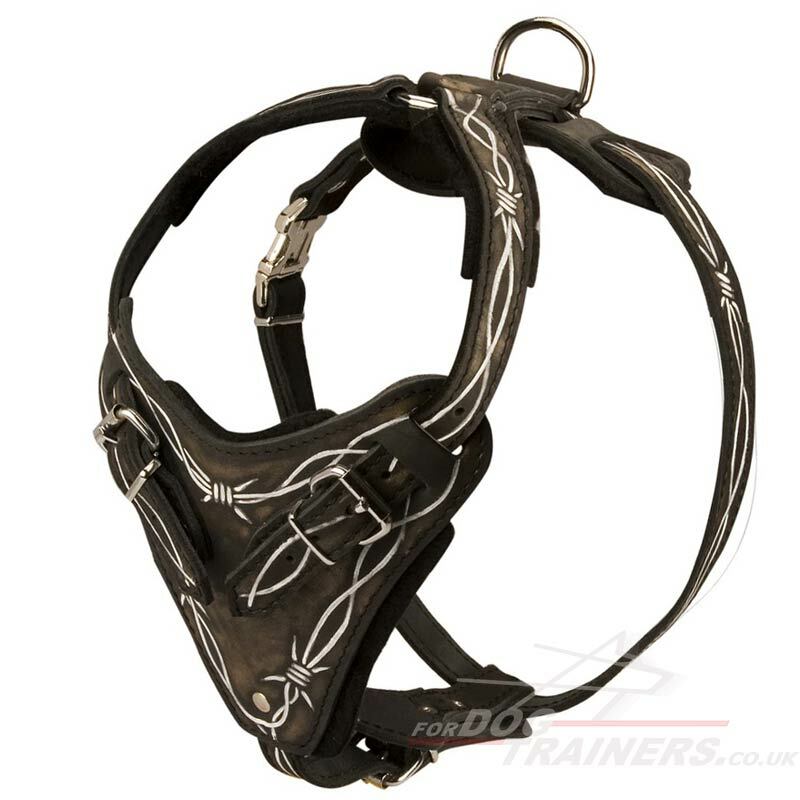 This genuine leather dog harness with designer painting "Barbed Wire" comfortably surrounds the torso of your dog. 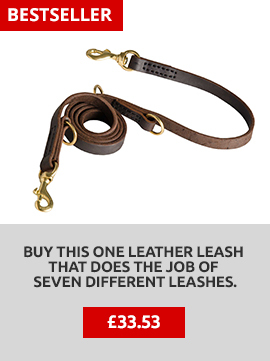 It is equipped with strong straps for reinforcement. Due to this practical design the force is distributed on whole body preventing chocking and slipping out. All metal parts are welded and chrome-plated. Leather straps are adjustable with metal buckle s on the dog's body. 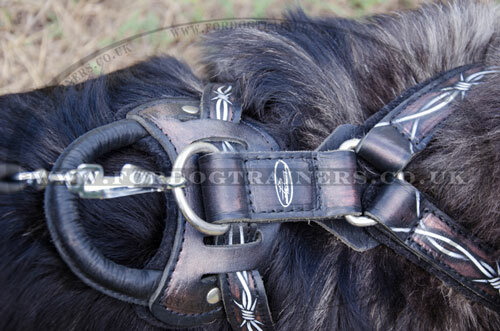 The useful feature of this designer leather dog harness is padded chest and back. 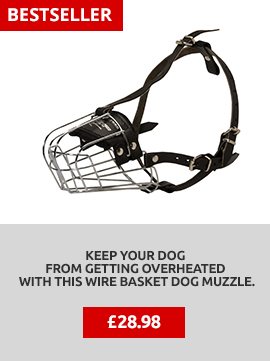 So you can use this soft chest dog harness for agitation and other types of training with your strong Caucasian Shepherd. Pillowy lining is to reduce the impact, thereby preventing serious injury to the dog. This is especially important for hard training on daily basis. 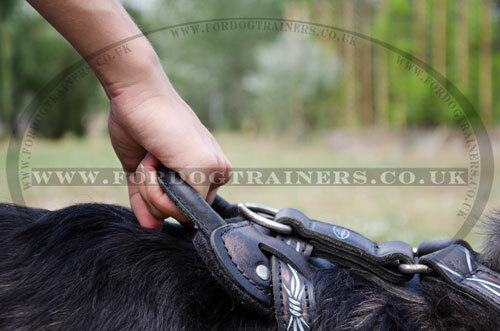 The dog body harness has a light weight handle for close control of your naughty four-legged friend. Comfy handle is titled in such position to allow for a more natural and comfortable grip. 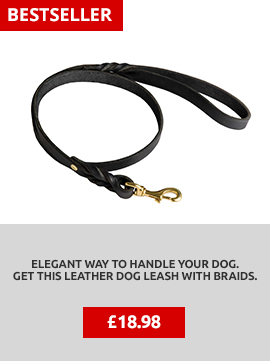 Please be assured that this elaborated leather dog harness with handle is totally eco-friendly to your Caucasian Ovcharka. We use safe paints which are also water-resistant. Unique hand-painted pattern "Barbed Wire" pledges you to be a proud owner of your stylish and strong Caucasian Shepherd dog. Buy stylish and reliable leather dog training harness to please your doggie with new accessory for your joyful walking and training. Strengthen your friendship, bringing bright moments into your life.